The gooey, almost glue-like quality of some top-shelf examples of cannabis is the result of a substance called resin. Resin, while a single component of cannabis, is comprised of many medical molecules, including the most important: Cannabinoids and terpenes. Cannabinoids are the chemical components that are responsible for the psychoactive effect and much of the plant’s medical efficacy. Terpenes are equally medicinal but are also responsible for the infamous and sometimes intense odor of cannabis. The most famous molecule in cannabis, tetrahydrocannabinol (THC), is a cannabinoid. Cannabidiol (CBD) is another example of a medicinal cannabinoid, albeit one that doesn’t deliver a euphoric high. Terpenes, like cannabinoids, do everything from fight cancer to alleviate depression to reduce or eliminate seizures in epileptic children. Examples include myrcene (which smells musky and is the most common terpene in cannabis), Limonene (which conveys an aroma of citrus), and pinene (which smells like a walk through a pine forest). There’s more to the story of cannabis resin, however. Resin is produced by special, nearly microscopic secretory glands on the flowers and sugar leaves of the plant called trichomes. These glands also appear on the fan leaves, stalk, and branches of the plant, but in far fewer numbers. There are actually six different varieties of trichomes, all of which serve slightly different functions. The largest of these siblings—and, thus, the type that produces the most cannabinoids and terpenes—is the capitate-stalked variety. At 50-100 millimeters wide, it is the biggest and most industrious of the trichomes. 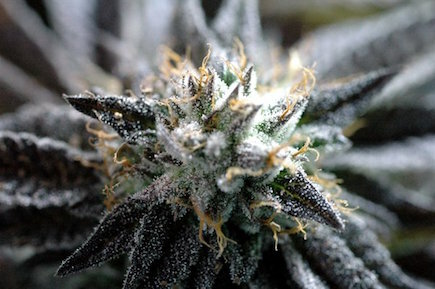 In cannabis cultivation, growers know their plants are near harvest when the trichomes begin to transition from clear to a cloudy, almost milky light red or orange. The small size of trichomes means that such inspections require a jeweler’s loupe or even a microscope. From an evolutionary perspective, botanists believe that resin was developed by the cannabis plant as a defense mechanism against insects and animals. The bitter taste and potent aroma of resin protect the precious flowers of the plant—which are hoping to find some pollen that floats by in order to become inseminated and propagate the species—before being eaten by a pest. From the perspective of humans, resin blocks UV sunlight, helping protect the delicate terpenes and cannabinoids contained within so they can do things like shrink cancerous tumors and lift depression in patients.